While PC VR headsets are fun, no one has especially enjoyed the number of cables required to hook one up. With separate video, power, and data cables, the end result has been that manufacturers have used somewhat unwieldy cables or breakout boxes. However as part of the generalized push towards the second generation of VR headsets, a new industry consortium is coming together today to reduce the requirements to a single cable. Backed by NVIDIA, AMD, Oculus, Valve, and Microsoft, the new VirtualLink standard is a USB Type-C alternate mode that will be able to supply all of the necessary power, video information, and data over a single Type-C cable and connector. Today’s announcement from the group is essentially a call for participation, announcing the group’s existence and inviting others to get involved ahead of the VirtualLink 1.0 specification. So the consortium and its members are broadly talking about the standard itself, but are not saying anything about products that may implement it. And indeed as of Monday evening as I’m writing up this article, the VirtualLink consortium’s website still isn’t up. In any case, the rationale for creating a standardized connector is pretty straightforward. A clunky multi-port cable is okay for first-generation early adopter products, but if the consortium members want to push VR adoption, then the setup process needs to be easier to reach the masses. This includes not only reducing the cable down to a single port, but also making these headsets easier to use with laptops, where HDMI ports are uncommon and DisplayPort is primarily picking up penetration through the popularity of the associated USB-C alternate mode. So a standard for a single cable, using the smallest yet most compatible port choice, is going to be the best way forward. What this amounts to is that the standard is being implemented as a USB Type-C alternate mode. USB-C is the natural choice here, as the wider industry is already consolidating around the port for external connectivity, and the port + cable is designed to carry multiple lanes of data along with significant amounts of power. In fact I was a bit surprised that this required a new alternate mode at all – we already have the DisplayPort alternate mode – but after checking with the consortium, there is a good reason for this. The official VirtualLink standard calls for 6 lanes of high speed data – 4 DisplayPort HBR 3 channels for video, and a single USB 3.1 Gen 2 channel (2 lanes) for data – along with 27W of power. And while you can combine the DisplayPort alt mode with those power requirements, the lynchpin is 4 lanes of video plus the USB 3.1 Gen 2 data channel. By the standard, DisplayPort alt mode replaces all of the USB 3.1 data channels, leaving only the much slower USB 2.0 baseline channels available. 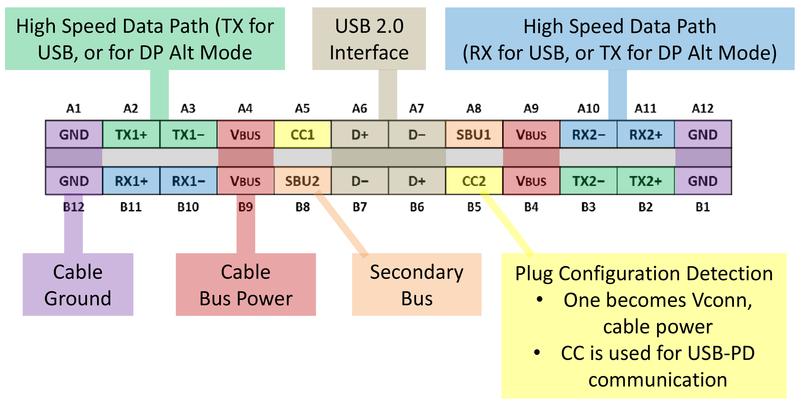 As it turns out, tucked away in version 1.3 of the USB Type-C cable specification released last year, the USB-IF has made some small but important changes to what alternate modes are allowed to do, which in turn means that new standards are needed to take advantage of these changes. In short, for direct connect devices – that is, devices connected directly to a USB-C port and not going through a hub or other extender/repeater – those devices are now allowed to reconfigure the 4 USB 2.0 pins (A6/A7/B6/B7) after the device handshake. So for the VirtualLink standard, this means that VR headsets can tap these additional 4 pins, giving them the extra flexibility they need in order to simultaneously meet the video, power, and date requirements of a VR headset. Diving a bit deeper, what this essentially means is that the 4 USB 2.0 pins have been turned into another pair of high-speed differential lanes, giving compliant USB-C connectors 6 high-speed lanes overall. 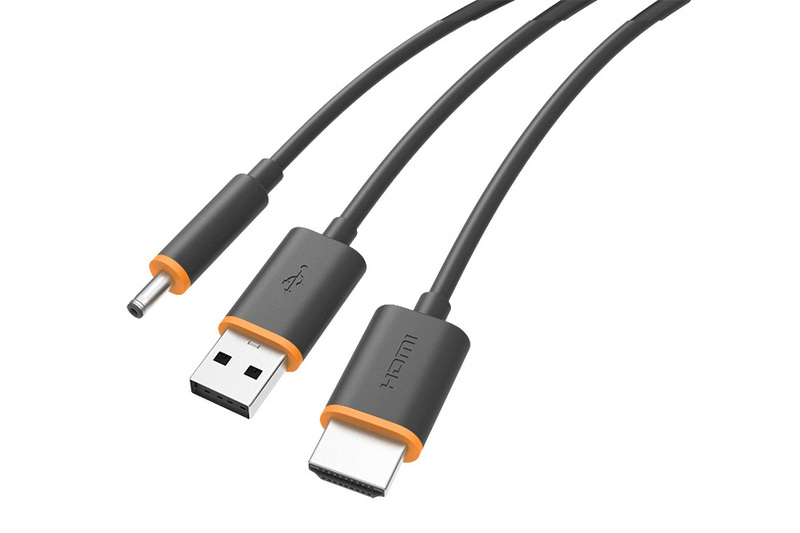 Normally these 4 pins are implemented in a USB-C cable as simple unshielded twisted pairs, which is sufficient for USB 2.0 data. However high-speed operation requires shielded differential pairs, which is not part of the base cable specification. But in the case of direct connect devices, they come with their own cable, meaning the usual cable rules can be thrown out the window and vendors can specifically use higher quality cabling to get away with high speed data on these pins. The net result of all of this is that the VirtualLink standard is a rather forward-looking standard in terms of capabilities. 4 lanes of HBR3 video data alone is equivalent to a DisplayPort 1.4 connector, which is to say that it offers enough video bandwidth for 4K @ 120Hz with 8bpc color. This is more than double the bandwidth afforded to the Rift and Vive via their HDMI 1.3 connectors. I also find it interesting that after favoring HDMI for the first-generation products, this change means the industry is shifting to DisplayPort. DisplayPort of course is royalty free, among its other advantages, however its packet-based data transfer paradigm is very different than HDMI’s classic pixel-based TMDS system, which is an important distinction when you’re talking about how to best fight latency. Meanwhile a full USB 3.1 Gen 2 data connection means there’s 10Gbps of bandwidth for data transfers between HMDs and the host computer, which right now at least is bordering on overkill. Though I’m very curious what the consortium is doing here (if they’re doing anything at all) to combat the fact that USB 3.1 Gen 2 data is normally only rated to run over 1 meter cables due to faster signal attenuation, which is a rather short cable length for a VR headset and the room scale experiences the vendors are pushing. Otherwise the 27W power standard sounds high at first as well, but it’s a sensible choice. The current Vive and Rift consume a fraction of that, but they had to be designed around the limitations of a USB 3.0 Type-A connector to begin with. As headsets become increasingly powerful in their own right – especially with inside-out tracking – a greater power budget will undoubtedly come in handy. As an aside, the consortium’s announcement doesn’t list voltages here, but 27W is almost certainly 9V @ 3A, a common mid-power point for USB-C devices. Unfortunately this is the limit to what we know about the specification at this time. As mentioned previously, the consortium’s members aren’t talking about specific implementations quite yet, such as which types of devices the members would like to put VirtualLink-capable USB-C ports on. For desktop PCs the logical choice is video cards – especially if USB-C eventually replaces the DisplayPort connector outright – which is something we’ve seen manufacturers toy with, but not actually reach shipping products. This would also be consistent with the consortium’s goals of making VirtualLink a low-latency port (owing to the comfort requirements for VR). The flip side to all of this is that AMD, NVIDIA, and their board partners would need to start implementing either USB 3.1 controllers or USB 3.1 headers on their cards, in order to supply the necessary data connectivity. Which is not too difficult to do, but it’s yet another feature that video cards would need to support. And without going too far down the rabbit hole here, where this ultimately could lead to is that we’re about to see a major shift in the kinds of ports available on video cards, especially if most video cards need to be VirtualLink capable to maximize the number of systems that can be used with VR headsets. Conversely, laptops should be relatively easy due to their highly integrated nature. USB-C ports are already common there, so it’s just a matter of adding another USB-C alternate mode. However it does call into question whether the consortium will be able to convince laptop manufacturers to adopt the alt mode for large swaths of their product lines (similar to the DP alt mode today), or if it will only be found on high-end gamer-focused laptops. In any case, this should be a welcome development for the industry as a whole. While VR hasn’t proven to be as immensely popular with consumers as some vendors had hoped, VR headset adoption has shown solid growth and spurred plenty of system upgrades to drive the data-hungry headsets. So anything that further simplifies the process is going to be a welcome move for consumers and hardware vendors alike.